The tallest hotel in Waikiki with commanding views of the Pacific Ocean and mountains from your spacious guest room lanai. Located two blocks from the beach and close to the International Marketplace, this moderate hotel in the heart of Waikiki offers the following free amenities: spacious pool and sun deck, mini-refrigerator, stove-top and microwave. 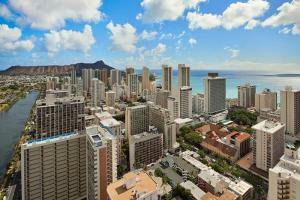 The hotel is located in the heart of Waikiki. 2 Blocks from the International Market Place. 15 minutes from the airport.